Bob Gill is specified as the websites creator. Windcast, 2002 is the owner of the copyright for this website. The web server used by Chanins.org is located near the city of Brea, USA and is run by New Dream Network, LLC. 11 other websites are located on this web server. Most of them are provided in the english language. Only a few websites on this web server are x-rated. 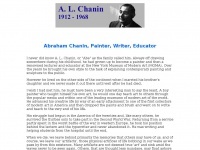 The websites of Chanins.org are served by a Apache server. The markup language of the website is HTML 4.01 Transitional. Both the inclusion of the website in search engines and follwoing of its hyperlinks is explicitly allowed.